Star Citizen is the game with the accolade of being the highest funded game in the history of crowd-funding. It does mean, naturally, that there’s a great big deal of hope and anticipation attached to the project – especially by fans who’ve bought in to Cloud Imperium’s wild and ambitious promises. I’m a little worried. While the game is shaping up to be an incredible experience for fans of Chris Roberts’ past games, there’s always the worry of feature creep. There’s always something new that’s being added to the monstrous game. The latest addition though, is an impressive damage model that tracks temperature, burn, thickness and deformation. It’s pretty darned impressive. This is only the beginning though – and now that the base for the damage model is in place, they’ll be adding even more. Oh boy, even more feature creep! But this isn’t the end of the road for this tech, there’s still several major features we’re working on. One of these is particle effects that are created, simulated and rendered entirely on the GPU, and this gives them two huge advantages. The first is performance, we can spawn 10-100 times more GPU particles than CPU particles for the same cost. The other benefit is that they tie in perfectly with the precise damage you’ve taken, so as the hull burns you’ll get glowing embers falling off, when it takes physical damage you’ll see shards of metal fly off, and when you blow out a large section of the hull you’ll see space littered with the debris. We’re also working on some major optimizations using to the damage system using DirectX . 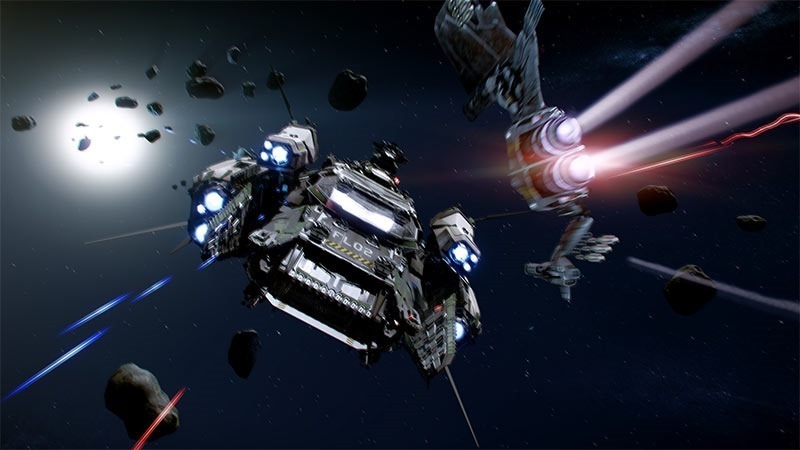 “Several lighting and particle setups are being prototyped to take our ship interiors through Healthy, Damaged, Critical and Flatline states that will inform and immerse our players during battle,” Cloud Imperium wrote in a post on the fictional Roberts Space Industries’ website. “Our new state machine being developed called GOST, will determine the healthy (or unhealthy) flow of energy around the ships systems and will have a big impact on our multi-crew interactions and the effect of ship damage on them. Star Citizen is easily one of the most ambitious and impressive video games ever created, but I think it’s starting to get to a point where there needs to be a little more of a concrete retail release. While those who have access to trhe game thanks to their part funding are revelling in each additional module, those who’re waiting for something closer to an actual, shippable product might have shifted their attention to something else, like Elite: Dangerous. Next article Is Bloodborne getting a PC release?